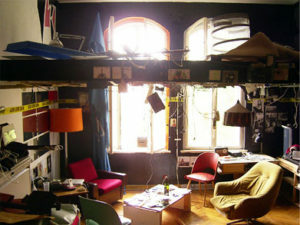 Usually, rooms in a hostel will be flat, simple and most likely messy. Even if there are just a couple of bed, two small tables and chairs for the roommates, chances are the room will be very cluttered and messy. But in order to live comfortably in your room, you have to get organized and keep it clean. In this post, I am sharing a few quick and simple tips to organize hostel room and that too without spending lots of time or effort. Being a student is not easy; you hardly have time and money to waste on décor. But at the same time, studying in a well organized and properly maintained hostel room will be just awesome. And if you wish to organize hostel room and transform the way it looks, then here’s what you can do. Clean room: Cleaning the room is the easiest way to enjoy a beautiful room. Whatever the size of the room may be, you can always keep it nice by cleaning. You must have a dustbin to throw away the trash, do not just throw away anything anywhere. You do not have your mom in the hostel to scold you, and then clean it herself; here you have to do everything. Keep the room clean; keep the things in the proper places. Do not pile up the books and clothes on the bed; rather develop the habit of keeping them in the cupboard and shelves. Assign separate places: You must allot specific places for individual items. For example, the wardrobe for clothes, the two racks for books, the third rack for the notes and documents, the corners of the room for the cricket bat, or tennis racket or any other sports accessories etc. Wash on the weekends: You can do the laundry on the weekends. Change the bed covers and bed sheets weekly, or at least twice a month. Clean your own clothes and other garments. Do not live in the hostel room as if you are in an exile. Do not have food on the bed: This is a very bad habit. Never use your bed as a dining table, have food in the college canteen. If you are having food in your room, then sit on the chair and have it. You can spread a newspaper first on the table, and then have the food, in case of any food spills. Paste some posters: The blank walls may look boring and dull. You can paste some pictures on the walls, some posters of your favourite artists or players, or some motivational quotes. The posters can be colourful to make the room look better. Rug on the floor: You can use a rug on the floor, a colourful rug which will cover some portions of the bare floors. Accessories: You can hang a wind chime near the windows and enjoy the tingling sound. You can even place some plants like bonsai, which captures very little place and are easy to maintain. You may use a room freshener to keep the space smelling fresh. Nothing beats the joy of living in a clean and well organized hostel room. You will feel comfortable while studying or relaxing. And when you keep your hostel room well organized, you learn the habits forever. How do you ensure that your hostel room is clean and well organized?